Andrew J. Shapiro, of New York, to be an Assistant Secretary of State (Political-Military Affairs), vice Mark Kimmitt, resigned. Jun 16, 2009 Reported by Mr. Kerry, Committee on Foreign Relations, without printed report. Eric P. Schwartz, of New York, to be an Assistant Secretary of State (Population, Refugees, and Migration), vice Ellen R. Sauerbrey. Jun 16, 2009 Reported by Mr. Kerry, Committee on Foreign Relations, without printed report. Bonnie D. Jenkins, of New York, for the rank of Ambassador during her tenure of service as Coordinator for Threat Reduction Programs. Jun 16, 2009 Reported by Mr. Kerry, Committee on Foreign Relations, without printed report. Ellen O. Tauscher, of California, to be Under Secretary of State for Arms Control and International Security, vice Robert Joseph, resigned. Jun 16, 2009 Reported by Mr. Kerry, Committee on Foreign Relations, without printed report. Kurt M. Campbell, of the District of Columbia, to be an Assistant Secretary of State (East Asian and Pacific Affairs), vice Christopher R. Hill, resigned. Jun 16, 2009 Reported by Mr. Kerry, Committee on Foreign Relations, without printed report. Eric P. Goosby, of California, to be Ambassador at Large and Coordinator of United States Government Activities to Combat HIV/AIDS Globally. Jun 16, 2009 Reported by Mr. Kerry, Committee on Foreign Relations, without printed report. Harold Hongju Koh, of Connecticut, to be Legal Adviser of the Department of State, vice John B. Bellinger III, resigned. May 13, 2009 Reported by Mr. Kerry, Committee on Foreign Relations, without printed report. Jeffrey D. Feltman, of Ohio, a Career Member of the Senior Foreign Service, Class of Minister- Counselor, to be an Assistant Secretary of State (Near Eastern Affairs), vice C. David Welch, resigned. May 19, 2009 Reported by Mr. Kerry, Committee on Foreign Relations, without printed report. Twenty-six other nominees for the State Department are currently undergoing committee consideration in the SFRC. Except for Capricia Penavic Marshall scheduled for a hearing on June 24th, the rest have not been scheduled for their confirmation hearings as of this writing. The Election Committee had certified the winners of the 2009 AFSA Elections. If you have not seen the results yet, check out NoDoubleStandards’ post here with the winning candidates identified by slate or the official announcement of the results in afsa.org. The new Governing Board will take office on July 15 for the 2009-2011 term. In any case, a Diplopundit source was kind enough to forward me the voting composition. AFSA has now posted that document online (pdf) but its seems only page 1 is available online; the other pages have not been included. 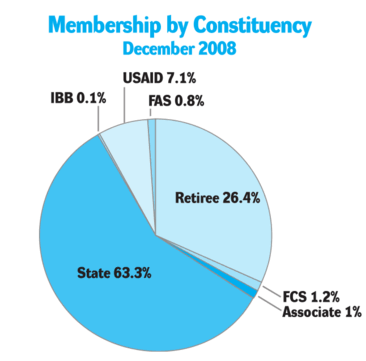 So — here is the AFSA membership and constituency breakdown as of 2008 (from annual report). According to its latest Annual Report, AFSA has 13,905 dues-paying members as of 2008. There were 3,326 ballots cast in this election, slightly higher than the last five AFSA elections. However, the ballots cast still amount to about 24% of the total AFSA membership (see Dead Men Working’s post on election stats here). Active-duty State employees are the largest voting bloc in AFSA at 63.3% of the total membership. In this election, State employees account for 1,459 of the total votes or 43% of the votes counted. However, 1,459 votes out of approximately 8,801 due-paying members amount to only 16.57% of this constituency. In short – only slightly more than 15% of active-duty State AFSA members sent in their votes. Retirees are the second largest constituents of AFSA at 26.4% of the total membership. In this election, AFSA retirees account for 1,568 of the total votes or 47% of the votes counted. However, 1,568 retiree votes out of approximately 3,670 dues-paying retiree members amount to 42% of this constituency. In short – almost half the total AFSA retiree members sent in their votes. And that made a difference. David Firestein of CLEAN Slate won the majority votes in the AID, FAS and FCS constituencies; he also won the State votes by a thin margin. However, Susan Johnson of Team AFSA got the miniscule IBB votes and the Retiree votes; the latter is important because the retiree bloc decided this election with 927 voting for Johnson against 603 who voted for Firestein. They have also decided to return Tex Harris as Secretary (for a 5th term) and Andrew Winter as Treasurer (for a 3rd term). (See the Governing Board composition here for the last five terms, 2001-2011; names marked in bold red have been elected more than one term). CLEAN Slate’s VP candidate, Daniel Hirsch also made the line-up, which must give those “ghost voters” in the AFSA forum some indigestion. On the representatives for the two largest constituencies — 8 candidates ran for 4 seats as Retiree Reps ; all 4 seats were carried by Team AFSA. On the State Representatives, 27 candidates ran for 9 open seats; CLEAN Slate won all but two of these seats. Which makes for an interesting combination in the new Governing Board: Team AFSA (10), CLEAN Slate (9), Unaligned/Undeclared? (5). Now – I’m not sure why a large chunk of active-duty State employees did not vote. It could be because — 1) they are happy with their lot; 2) they have no confidence in AFSA, 3) they feel their votes won’t make a difference, 4) they feel turned off by the negative tone of the campaign; 5) they forgot to send in their votes; 6) they meant to vote but ran out of time or 7) they feel anybody from the FS would represent them just as well. Did I miss any other reason for not sending in the ballot? C’mon, you can dish here, can’t you? What seems striking — at least to me, is that the retiree bloc has decided to a large extent, the composition of the leadership of the AFSA Governing Board in this election (I don’t know if this has always been the case, enlighten me, if you have some AFSA history). The other thing that’s striking is how a few names kept popping up in the Governing Board list in the last 10 years. I do think it is admirable that experienced hands are willing to contribute their time and talents to AFSA’s work on behalf of the Foreign Service. However, it is also undeniable that AFSA needs to grow the next generation of leaders needed to negotiate with management on issues affecting a changing Foreign Service. It would be interesting to see if this incoming Board recognizes the importance of cultivating its leadership pipeline for the next decade. I am thankful for the Court’s decision and for our judicial system which gives each American the means to protect his rights and reputation. For almost nineteen years I was proud to make my career in the American Foreign Service. Every chief under whom I worked and every competent and authorized review of the facts found my service useful and loyal. In December, 1951, the world was informed that I had been summarily dismissed for “doubt of loyalty”. Administrative appeal was refused, and legal action became my only recourse. Through it, the unfounded action of the Loyalty Review Board was declared illegal and expunged. The Government eventually conceded that my discharge was not based upon doubt of my loyalty or security and that its sole basis had been the illegal action of the Loyalty Review Board. Now the discharge has been declared illegal and the slate is clean. My debt is great: to my attorney, Mr. Charles Edward Rhetts, who accepted the case of a stranger more than seven years ago and, without regard for his own interests, has since devoted his great ability to clearing my name; to the several attorneys who in association with him have contributed to this outcome; to a courageous employer who was willing to give a job to a man publicly defamed; and to hundreds of friends whose unshaken confidence supported my family and me in this long fight for vindication. Read more in the Library of Congress Frontline Diplomacy Collection.